Finally we’ve managed to get our hands on the most sought after football game on the planet, FIFA 16. Check out our review from FOOTY.COM. Another year, another FIFA. We are going to look at the changes, improvements and the negatives in a comprehensive round up of the latest instalment. 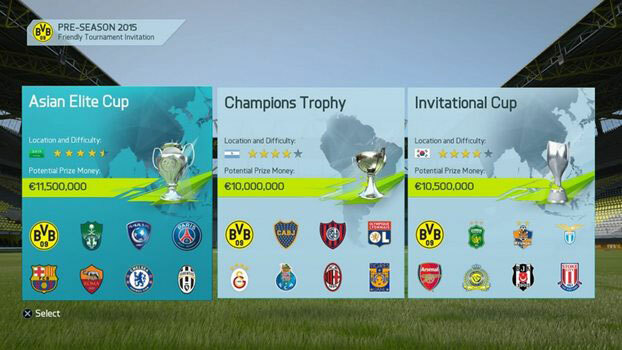 This year it will take you about 10-15 matches to figure FIFA out and we think that's a good thing. 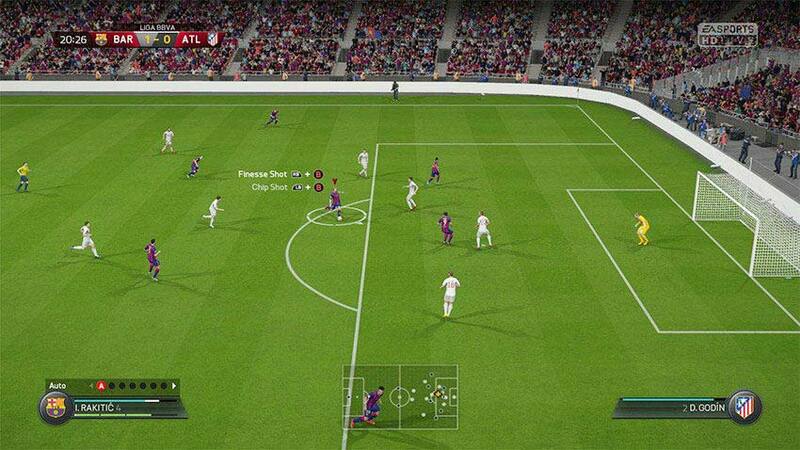 At first you will find it a very defensive game and hard to make those chances, that is exactly what FIFA has needed. Tactical play from the player, to find out the weak spots, how to break down a defence and exploit holes. One feature that works wonderfully is "passing with purpose", this lets you play a sharp, incisive pass with precision to a team mate, a ball that has been missing in previous FIFA games, always having to use a lofted powerful ball rather than one along the ground. It really helps you build up passing movement, space and can put that killer ball through. FIFA trainer is a nice way to get used to new features and gameplay. Another new feature is the "no touch dribbling", this may take a little while to get used to and to perfect but it can be used to great effect. A drop of the shoulder and shifting of weight can have a defender terrified. Combine this with a skill move and you will have the opposition worried. Dynamic crossing is vital, we have managed to play some wonderful balls to our strikers because of this. It really does feel natural, not mechanical and pre-determined. This is a huge improvement by EA and it all adds to a great package. Every year we see slight improvements in graphics, but this year it really does seem like it has been polished to a high level of perfection. Player likeness is astonishing for almost every player on the game, stadiums are beautiful, the grass looks as good as you would wish for and how can we forget the vanishing spray! With official presentation packages for leagues such as the Premier League and Bundesliga, it keeps the experience as authentic as possible. 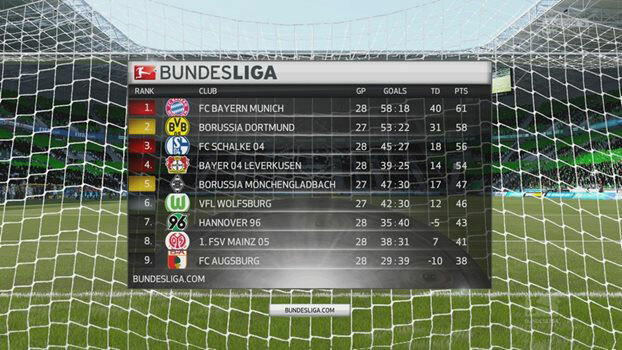 Bundesliga presented just as it would be on TV. All new weather conditions and times of day have been introduced to allow for a greater variety of conditions, sunny, overcast, rain, snow, hazy, partly cloudy, foggy, showers and flurries. That's a lot of variables which can drastically change a match, as well as this, EA have introduced more kick off times. Career mode has always felt a little left out when it comes to FIFA, each year passes and nothing seems to change or improve. This year there have been one or two key changes, the first of which is the new pre-season tournament selector. You get to choose between three 8 team tournaments of which each has a different difficulty and prize pay out. Your prize money depends on how well you do, so you can use pre-season for finding your best team and earning money. Vital if you are working on a tight budget. Test out your squad in a pre-season tournament. Player training, this is something that has been needed for years. You can improve players in areas they are weak in or just make them a whole lot better. Train up to 5 players per week, make them work on their attacking, defence, set pieces, dribbling or passing depending on what you think they need to improve on. This has been long overdue and you can really improve your players the way you want them to develop. You can also train players in your youth academy so nurture them before you sign them. Develop your players exactly how you want them. It's hard to talk about FIFA without mentioning Ultimate Team, the highly successful and lucrative game mode. After introducing price ranges midway through FIFA 15 (quite controversially), this has been the first time it has been used from the start of the game. It was a dramatic improvement and allowed game players who may not have been able to afford the top football players beforehand by dropping players such as Ronaldo and Messi from 15m coins to around 3-4m, still an astronomical number but a huge improvement. FUT draft mode has been the hot topic of FIFA 16 so far. The Draft Mode has been talked about a lot this year. You pick your captain from 5 of the game's stars, then you fill the rest of your squad, one position at a time. Do you focus on chemistry or player ratings? It's a delicate balance to get the best team possible. You could end up with Ronaldo, Messi and Neymar upfront! This is something new and different which felt much needed in Ultimate Team this year. Well, we have to say there are improvements across the board in FIFA 16, from gameplay to game modes, you will notice the difference and appreciate it, but for how long? Already we have felt it has lost that "new" feel to it and it's just FIFA again. The honeymoon period of this game felt too short, not enough new content or innovations, FIFA really do improve every year, but it is getting to the point where you have to wonder is that enough? Let us know what you think in the comments area below. 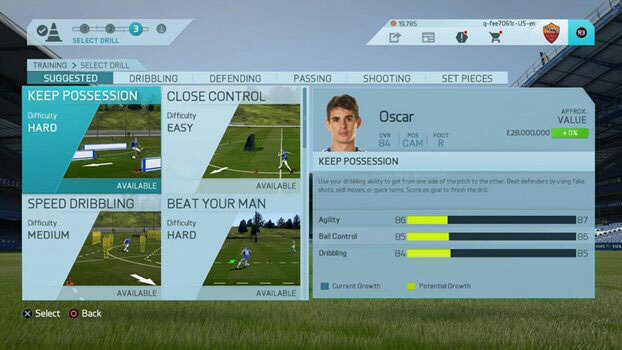 * Gameplay images courtesy of EA Sports.